“The new data will show whether [the hint in the December data] was a fluke or whether they are really on the road to discovering the long-lost [Higgs] boson, physicists say. They are racing to make a deadline to report the results at the International Conference on High Energy Physics, or Ichep, in Melbourne, Australia, starting July 4. This is NOT “the boson’s last stand”, and NOBODY agrees that it is the case. What everyone agrees (with one caveat about heavier Higgs particles that actually haven’t been ruled out yet) is that it is the last stand of the Standard Model Higgs particle. The Standard Model Higgs particle is only the SIMPLEST possible type of Higgs particle. Read about this form of Higgs particle here, if you like. Let me say that again. There is a big difference between ruling out the Standard Model Higgs particle and ruling out all possible forms of the Higgs particle. Unfortunately, I’ve previously had to criticize the New York Times on precisely this point … back in August 2011. Not finding the Standard Model Higgs particle — in Phase 1 of the Higgs search — just means that Phase 2 of the Higgs search has to involve a wider set of search strategies. The two phases of the Higgs search was one of the main topics of my Cosmic Variance guest-post article and of this slightly more detailed article (both articles a bit out of date now as far as the data, but the basic point about the two phases still holds). And in fact I pointed out in a related article, linking to some scientific lectures I gave on the topic, that it will take ten years to be confident there is no Higgs particle of any type. I’m not telling you anything radical; ask any theorist in the field who has worked on Higgs physics and they will tell you the same thing. So to say that “theorists will have to go back to their drawing boards” if the Higgs does not show up by December 2012 is badly mistaken. There are hundreds of theory papers, going back decades, on versions of the Higgs particle (or particles) that would not show up by December 2012. Here are some examples of such papers by well-known authors: http://arxiv.org/abs/hep-ph/0009158 ; http://arxiv.org/abs/hep-ph/0608310 ; http://arxiv.org/abs/1012.1316; there are plenty of such papers from the 1990s and even the 1980s. Heck, I even wrote some myself. One other minor error, caused by out-of-date information: the discrepancy between the masses of the possible Higgs signal seen at ATLAS and at CMS (which made the statistical combination of the two data sets unstable to small shifts) did indeed shift when the CMS data was reanalyzed in March. The shift went in the “right direction”, eliminating the discrepancy and increasing confidence in the consistency of the ATLAS and CMS results. On the other hand, the significance of the signal seen at ATLAS and CMS went down in March, too. A complicated story; but these details won’t matter in the long run. Of course, all of this may be moot, if more evidence for the Higgs shows up at the ICHEP conference in July. But please, NY Times, get your facts straight on this very important point, which lies at the heart of the LHC program! No discovery of the Higgs particle in 2012 absolutely will not mean that we know there is no Higgs particle at all. It just means we would give up on the simplest version of the Higgs (which would be great news! 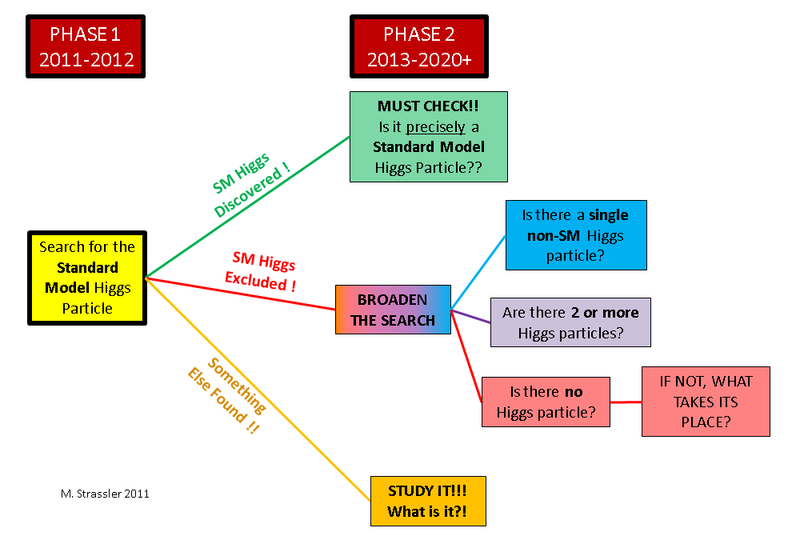 ), and that the Higgs search would move on to Phase 2. Simplified diagram of how the Higgs search proceeds at the LHC; 2012 will be the transition point between Phase 1 and possible branches of Phase 2. This entry was posted in Higgs, LHC Background Info, Science News and tagged atlas, cms, Higgs, LHC, press. Bookmark the permalink. The misleading information published by the NY Times is yet another reason why spreading rumors on incomplete findings is ill-advised. I meant — maybe some theorists would and some wouldn’t. Your article appears to me to be more misleading than the NY Times one. Theorists would have to go back to the drawing board if no std model Higgs is found as it is obtained even in non std model theories in certain limits. That these limits may be relevant in nature has both theoretical motivation (for example in non-SUSY theories a second low mass Higgs would require additional fine-tuning) as well as backing from precision expts. A complete wash out of std. model Higgs signal so that there are no excesses in the current data would surely send the theorists back to drawing board. Your comment is also logically incorrect. Your statement that “the Standard Model Higgs is obtained in certain limits of other models” is logically irrelevant. What is logically relevant is that the “the Standard Model Higgs is NOT obtained in large regions of parameter space of other models”. Your point does not make the Times article correct; however, my point does make the Times article incorrect. Hi Matt — I think you are mistaken. Std model Higgs is in fact obtained in large regions of parameter space of non-SUSY models. The reason std. model Higgs is about to be discovered is in fact because of this — it is not because standard model is the only theory but because it is the NATURAL low energy limit of “Beyond Std. Model” (non-SUSY) theories. The natural scale of any additional beyond the standard model (non-SUSY) Higgses is a large mass scale — or else there has to be further fine-tuning to keep these additional Higgses light. If we have your point of view the reason why a std model Higgs is about to be discovered will be missed. “Std model Higgs is in fact obtained in large regions of parameter space of non-SUSY models.” Now we are discussing the meaning of “large”, which is a waste of our time. There are some models in which what you say is true; there are some models in which what you say is false. Most of the models I know of where the Higgs would not be found in 2012 are non-SUSY models, so your statement is not universally true. It takes one new particle not predicted by the SM or minimal SUSY to make the Higgs decay to undetectable particles, or to very difficult-to-detect final states, and therefore require a specialized search. ONE. The New York Times made the statement that the ICHEP conference is the Higgs boson’s last stand. That would imply that if the LHC does not find the Higgs this month, there is no point in looking for the Higgs anymore; it’s over. That’s profoundly wrong, and you know it. When I said: “Std model Higgs is in fact obtained in large regions of parameter space of non-SUSY models.” it is for the set of non-SUSY theories that have an electro-weak scale (ie) there is the usual problem (and therefore finetuning) of an low electroweak scale in all non-SUSY theories (that SUSY solves). Are you saying that following on your personal theoretical prejudices, we should close down the search for the Higgs boson if it isn’t found in July? No not close down Higgs searches — I said theorists would go back to the drawing board. Higgs searches would of course continue. Maybe some would and some wouldn’t. I guess you and I have different theoretical prejudices. Were there any cases when, during the search for some particle, it was discovered not in the simplest form? I.e., the previous data allowed both simple and complex form and then new data contradicted the simple and supported the complex? Absolutely. The Standard Model was nice and simple with four quarks; why are there six? The Standard Model was nice and simple with a photon, a W+ and a W-; why is there a Z? And Yukawa’s pion was discovered — and then realized (whoops!) to actually be what we know call the muon. Of course in retrospect we can look back and construct arguments that actually the Standard Model is very nice with six quarks and with a Z. But AT THE TIME, no, these were not viewed as the simplest possibilities. Oh — and the simplest neutrinos would be massless and wouldn’t oscillate. But they do oscillate. Right in general, but you picked a wrong example: when the charm was discovered, everybody knew there had to be a third family, otherwise CP violation (discovered 10 years earlier) would have made no sense. Indeed, three generations had been foreseen by Kobayashi and Maskawa even before the charm was discovered. Tommaso; thank you for your comment. I am not sure exactly what people thought in 1974; again, the question is what does “simplest” mean. First, there are other ways to introduce CP violation than to use 6 quarks. You are right that Kobayashi and Maskawa pointed out that 6 quarks was one approach, but my understanding is that by no means did everyone believe this was the case… especially since charm was discovered in 1974 and Kobayashi and Maskawa’s paper, written in 1973, was not immediately appreciated across the field (to my understanding). Perhaps someone who was there at the time could comment. I don’t have time to do the historical research today. Also, can you please allow comments without forcing commenters to either register with WordPress or to allow your blog to tweet/post for them? This reminds me of a ship’s mate who did his Master Mariner exam. The examinators asked him what to do, laying at anchor off the coast, in case a big storm would start to make the anchor drag. More slack to the chain, the mate replied. Yes, but the storm increases, one of the the examinators insisted. More slack, the mate answered. But if the storm becomes a typhoon? Don’t you worry, the mate said I have more chain than you have winds. But where do you get all that chain from? Well, from where you get all your winds from. The mate did not pass his exam. I wonder where all the Higgs particles come from. Where do all the different types of Higgs particles come from? A very profound lack of confidence that we understand what nature is actually up to. thanks for writing this. I was reading the NY times article just an hour ago and this ridiculous sentence about “the higgs’ last stand” made me want to tear my hair out. Shameful, couldn’t be more wrong. As a graduate student who has spent the last 4 years working on Higgs physics, I have to agree with Matt. It is one thing to have an open mind, but to say things like “the higgs’ last stand” or “theorists have to go back to their drawing boards” is quite the contrary and misinformation to say the least. I don’t normally enter these frays, but i can’t let this one stand. The phrase “at least as physicists have envisioned it for the last 40 years,” was intended to make exactly that point to the lawyers, doctors, liberal arts majors and others who read the Times but are not physicists. I’m sorry if the point was not clear. I have enjoyed and learned a lot from this and other blogs, so it was painful to open it up this morning and find this headline. Dennis, I never expected to have you reply, or notice — I must admit. I do understand, now, what you were trying to do. Let’s see if we can find middle ground. I’m on a call at the moment; will get back to you. Dennis – thanks for your remarks. Let me try to explain why you got such a strong reaction from me, and why I view this as such a deeply serious matter. Everything I’m about to say may be moot, if the Higgs shows up at ICHEP. But let’s assume it does not. All of these conclusions would of course be horribly wrong, and all of them would be potentially very damaging to the future of the LHC and of high-energy physics research. One can only imagine what could occur if leading politicians in Europe came to these incorrect conclusions. I understand that your job is not at all an easy one — you must convey complex subjects in very few words to a very diverse public. But the New York Times science section, and your articles in particular, are hugely influential. Given your extremely powerful position, I feel (and I know I am not alone) that strongly-worded phrases like “boson’s last stand” and “how physicists have envisioned it for the last 40 years”, though meant to convey excitement and importance, are also very dangerous unless they are precisely true. In constructing this website I myself struggled for some time regarding how to convey the distinction between the specific case versus the general case — the Standard Model Higgs versus the Higgs particle (or particles) in general — and to convey how the Higgs search would proceed depending on whether a Higgs was found in the first few years. I’m obviously not suggesting you copy what I have done, but I do suggest that it is important for science journalists (not just yourself) to find some way of conveying that we are coming to the end of the beginning, and not the beginning of the end, and of conveying that the LHC was designed not only to look for this simplest type of Higgs but for all of the others too — to sweep the floor pretty darn clean over the coming decade. Otherwise we may end up with a public that thinks particle physicists are changing their tune to fit the data — that after 40 years of saying there would be a Higgs of one type, they’re now saying (after it doesn’t show up) that maybe the Higgs is of some other type. It would be tragic for such a false impression to lead to even more distrust of science and of scientists than we already have in our society. I think I speak for many of my colleagues in requesting that you please try to be more careful, and not risk turning a potential great success at the LHC — the ruling out of the Standard Model — into a nightmarish political disaster. In this I am not asking you to twist the truth; on the contrary, I am asking you to present it more clearly. I think the NYT article is good and no correction is needed to be made by the Times. If this Higgs signal evaporates and there is also no SUSY Higgs or >600 GeV mass std model Higgs found, then LHC would in all probability. find something else that is new and exciting. The Higgs searches will of course go on to see if it manifests in a non-std model manner but there would have to be significant efforts/searches that are made assuming there is no Higgs. Well, if you think “boson’s last stand” is consistent with what you just wrote, there’s no convincing you. It will be YEARS before we know there’s no SUSY Higgs, in the NMSSM. I think such caveats are understood to be there in the NY Times article. You and I do understand those caveats are intended to be there. But the audience of the Times article is people who are not high-energy-physicists; how are they to know? Note that Brout, Englert, & Higgs shared the 2004 Wolf Prize. Also, Guralnik, Hagen, Kibble, Brout, Englert, & Higgs shared the 2010 Sakurai Prize. One might say that the powers-that-be in particle physics have already declared that nature must contain a Higgs field. I conjecture that nature contains a Higgs field if and only if the finite nature hypothesis is false. Thanks for making this point, Matt. I agree that the second paragraph you quote from the New York Times article is potentially highly misleading. It’s very important for the media to clearly make the distinction between a Higgs boson with all properties exactly as predicted in the Standard Model (SM), and a Higgs boson with some properties that are not as predicted in the SM. Current LHC data is only starting to scratch the surface of even simple beyond-the-SM Higgs possibilities. A non-discovery in July would be very interesting, but it certainly wouldn’t mean that a Higgs boson of some sort does not exist. The article would have been much better if he had referred to the Higgs as ‘The God Particle’ or even better ‘The God Boson’, don’t you agree Matt? 🙂 Some kudos are indeed owed to Dennis Overbye (and his editors) for avoiding the use of this term! Thank you. I appreciate it, and am honored that you read this blog. I believe that you are nit-picking over this reasonably well written NYT article. Though the article might not split hairs in the way you (or perhaps I) would like, it does give the lay reader the gist of the issue. Where have you been when others have allowed…nay fostered…journalistic trash about experimentally unfounded theories? In my reading, the article in question was the closest to jounalistic integrity in reporting particle physics as I have in recent years. I can’t address all articles written by all people. I am not going to bother with obvious junk. But a well-written article in the New York Times, when it misleads in dangerous ways, is precisely the type of article that must be addressed. As for “splitting hairs”!!! What kind of a hair is this??? The difference between a completed Higgs search and a beginning of a new phase of the Higgs search is a HAIR? I simply am stunned by this reaction. Let’s face it. The article was written for general population – not physicists. Overbye did not go into a complete dive on the boson or history For example as Daivd implies – he did not mention Brout-Englert paper (which was first but had no boson) or GHK which I believe was after Higgs by a couple weeks but had the boson more complete. Hard to write an article on ths topic that pleases everyone. as I said in my comment above, I know that Overbye has (and other science journalists have) a very difficult job. But they also are the shapers of public opinion and public knowledge. When they make strong statements that would give a very wrong impression, they are creating false expectations and potentially influencing the future of scientific research. If you don’t think journalists are powerful, I think you ought to look at history more carefully. And since most people get their scientific information largely from journalists, this is especially important in this case. Guest Post|Matt Strassler on Hunting for the Higgs|Cosmic Variance . Hmm… I suppose I could draft something like that. In my experience nothing I send in anywhere ever gets published on op-ed pages; I don’t have the public visibility of, say, Lisa Randall. And a “Letter to the Editor” is too short to make points clearly; moreover, often letters gets cut in ways that might change the meaning. Excellent point, Matt. Keep up with the good work. Hi Matt! Big fan here; I’ve been reading your blog for about six months or so, silently lurking, learning and enjoying very much! This is one of my favorite physics blogs! Point is: good science writing is vital to society! Perhaps unintended, but the statement made by the NY times is clearly incorrect and misleading (as any particle physicist knows!). Matt is certainly right that such a wrong statement can cause substantial harm. Instead of arguing, one should accept the criticism and move on. I believe some exciting news are lying ahead, and we should focus on their implications..
Overbye is correct. Failure to find the Higgs at 125GeV will be the death of the Standard Model Higgs, and the generally accepted theory of the last 40 years will have to be reconsidered. It is a weak argument to point to obscure papers that considered alternatives to the Standard Models. No one believes in those papers. Overbye’s point is that excluding the Higgs will disprove conventional wisdom of 40 years, and he is absolutely correct about that. You’ve just called work by many of the world’s best theorists ‘obscure’. I think we all agree that ICHEP will be historic and that demise of the Standard Model would be spectacular. If the LHC proves the Standard Model wrong, then sure, people will be fishing thru those obscure papers looking for ideas. Theorists will also be going back to the drawing boards. That’s what happens with a 40-year-old theory suddenly goes bad. But unless and until that happens, I am afraid that those obscure Higgs alternatives will not get much traction. Who cares what ideas have traction? This isn’t a popularity contest. We’re trying to figure out what’s Right. What is needed is a thorough, systematic search of the possibilities, using many years of LHC data. I think Roger has the clearest defense of Overbye on this page. Overbye is treating the Standard Model that Weinberg, Salaam etc wrote down as far more serious science than models hundreds of theorists of the next generation have written down. Ideas and models are cheap – Weinberg’s model has earned its right to be taken seriously. The LHC was built because of the confidence of the physics community outside of just hep-ph modelers in the science of the Standard Model. There isn’t enough confidence in the work of the post-Weinberg modelers to built a $10000 experiment. Strassler’s beef appears to be with Overbye not taking post-Weinberg models quite as seriously as Weinberg’s. If Overbye had said “this is the last stand for `Weinberg’s model'”, as you call it, I would never have complained. What he said was “this is the last stand for the Higgs particle”. The first statement is more or less correct. The second is false, and would imply, incorrectly, that if no Higgs turns up by early July, it’s time to stop looking for the Higgs particle. If you look carefully at what I wrote in my post, everything I said is completely consistent with the statement that “this is the last stand for `Weinberg’s model'”. I happen to have called it “The Standard Model”. it seems to me that the NYT article had very good intentions but has incurred in the mistakes professor Strassler points at. At this stage I think it would be a good idea if NYT wrote a follow-up article, not to apologize to anyone but rather to take the opportunity of telling laymen about how investigating Nature is such an exciting adventure. Science should not be proposed to the public as a scary beast but rather as something fascinating to feel emotions for, the same emotions that push investigators in their quest for the unknown. This is the best selling point for science I can think about. If NYT wanted it could participate in raising interested emotions toward science, before awareness, in the US society and not only. Congratulations on your science communications efforts, professor Strassler! Lighten up, Matt. It’s not like politicians read the Science section of the Ny Times. They’re politicians! And stop putting so many links to your own material. It’s so distracting and makes you look so self-absorbed. It is true that politicians don’t necessarily read the Times. But the staffers charged with providing them with advice on how to formulate science policy most definitely do. You’re the first person to complain about the internal links, which are intended to help readers who need background material in order to understand the jargon or technicalities that I’m talking about. If other readers complain, I’ll stop. Please keep putting in links to older posts. There’s some excellent information in them, especially for people who’ve just found your blog. Strassler: And a “Letter to the Editor” is too short to make points clearly; moreover, often letters gets cut in ways that might change the meaning. Matt, that’s exactly the problem. As a physicist, you never have enough space to explain a physics problem to your satisfaction in the allotted time/column space. Overbye is doing the best he can in the circumstances. Lay off him. I agree I was overly harsh, given that (as he said) he *was* trying to convey the point. More on Monday. if the 125 GeV signal is confirmed, is one sure that in all the analyzed Higgs channels one is is indeed measuring a spin 0 particle? Or could some channel signals be due to a spin 2 particle as well? It will not take long to figure this out by measuring angular distributions for the photons. But I myself have not looked at how long it will take. More important, if the ratio of the rate for the particle to decay to photons to the rate for it to decay to W and Z particles matches expectations even roughly, that tells you you’re almost certainly looking at a Higgs particle. It’s difficult (not impossible, but much less plausible) to get those ratios in any other way. In a world where even carefully-written articles by serious physicists often have colleagues chastising them for “gravely misleading the world” in the comments section, I cannot imagine that any article written by a non-scientist, no matter how well-intentioned, could ever really be precise and perfect enough to avoid the criticism of the scientific community. I would guess that your points are entirely correct, both about the physics and the probable political consequences of those misunderstandings, but short of letting you write the article yourself, I just don’t think there’s anything that a writer with a normal IQ could have done to produce a satisfactory piece. A newspaper article on advanced physics is not a textbook: it is certainly going to be somewhat wrong, very likely with unfortunate political fallout. Clearly, the author reads this blog, and did his very, very best to summarize what he thought he knew about the subject with as few errors as he could manage. What more can you expect? In short, I wonder if maybe these problems are unavoidable in an era when specialization is the norm and most people inevitably don’t really understand most other people’s professions. I’m with Overbye… Prof. Strassler you overreacted. Sure the Higgs could be non-standard… epicycles can always be added. Even the general public understands that… as Sherlock Holmes, well known by the general public pointed out… when you have eliminated all the other possibilities, all that is left is… etc etc….. but ruling out the simple SM Higgs is a major milestone in that process. I was very impressed with Overbye’s last paragraph, carefully worded to avoid the misconception that the Higgs is the origin of all mass… QCD provides more mass than the Higgs does in our universe, from massless gluons, itself a fascinating topic much neglected. And who knows what the origin of the Dark Matter’s mass is. Hey there good web-site! Guy. Exceptional. Remarkable. I will book mark your web site along with take the feeds also? I am content to get a lot of useful info through this article, we want acquire a lot more approaches for this consider, many thanks for sharing.